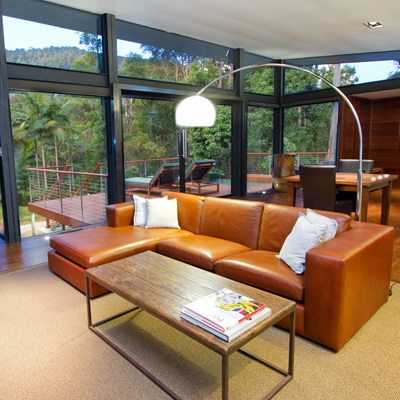 Crystal Creek Rainforest Retreat offer luxurious mountain view lodges, its located between Byron Bay and the Gold Coast. When you hear the word lodge you build a picture of what to expect. Whatever picture you’re building is going to be underwhelming in comparison to what you experience in this Rainforest Retreat. The lodge is not just raised off the ground to add to its stature. The area experiences heavy rainfall at different periods of the year, and the raised design avoids any flooding issues. 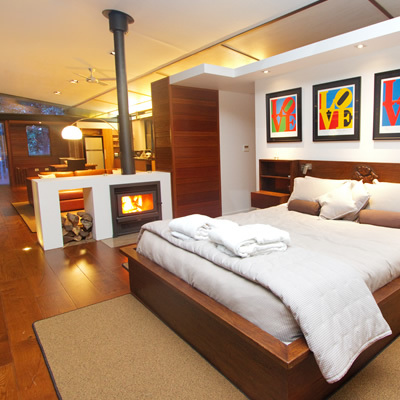 Upon entering the lodge we were blown away by the size and stunning interior design. The lodge is completely open plan and allows you to see from one end to the other. It includes a fully equipped kitchen, a large lounge with the most comfortable brown leather sofa, a huge plasma TV and surround sound HiFi which we put to good use. The bedroom area is beautiful and has a stunning hand carved wooden frame with a glass skylight above the bed. This is a wonderful touch, and allows you to watch the stars at night in this incredible part of the world. 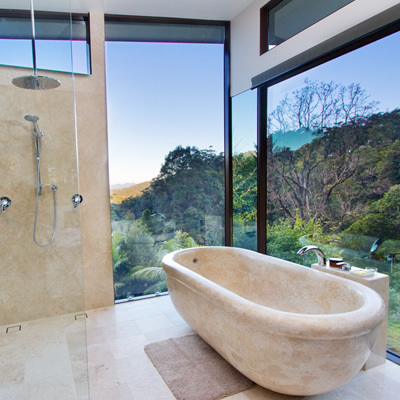 The bathroom had the most beautiful marble bath tucked in the corner of the property which offers 180 degree views across the rainforest. Couple this with the rest of the property having glass flooring and you are spoilt with the views you have across the surrounding rainforest. The bathroom also has a drench style shower, along with his and hers wash basins. 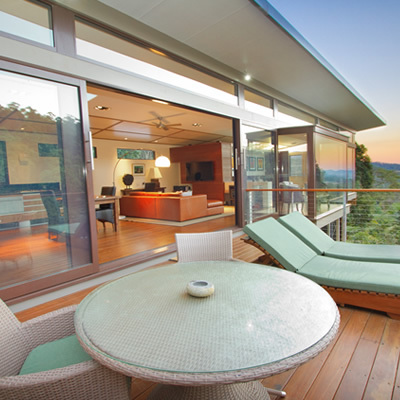 "This is luxury self catering at its finest." There is also a walk-in wardrobe tucked away behind the bedroom, a nice touch for the ladies to enjoy. It was big enough to store all of our luggage, so it gets a thumbs up from us. That covers the inside of the lodge, moving outside through the huge sliding glass doors there is a lot more to explore. Our terrace was home to very comfortable sun loungers and a large dining table and chairs, and my personal favourite aspect was the gas powered BBQ. The retreat doesn’t have a restaurant, but what it does offer is breakfast hampers, picnic hampers, and gourmet dinner hampers. Again, the word hamper doesn’t do this justice. The quality of the food in these hampers was exceptional. They cover everything you could possibly need, and they were outstanding. They are delivered each day and all you need to do is cook the ingredients on the BBQ. Our breakfast hamper included their Bacon and Egg Breakfast. Which included Double Wood Smoked Bacon, Roma Tomato Herb Seasoning, local Free Range Eggs, Mushrooms, Sausages, Milk, Wholesome Multi Grain Bread, Butter, Tomato Chutney, Tea and Coffee. I’m sure you’ll agree, everything you’d want from a hearty breakfast, they also offer vegetarian menu options. Some of the gourmet dinner hampers available include Fresh Seafood, which contains Fresh Green Prawns in a homemade Tomato and Garlic Marinade, Atlantic Salmon Steaks with Garlic butter Green Salad, Rainforest Herb Potatoes, Ciabatta, Salad Dressing, and Dessert Cake of the day. They also offer a Beef Hamper, with Premium quality Porterhouse Steaks, Homemade Mini Rissoles, Greek Salad with Organic Feta, Rosemary & Garlic Potatoes, Ciabatta, Salad Dressing, Tomato Relish, Whole Grain Mustard, Balsamic Salad Dressing, and Dessert Cake of the day. Finally, there is a Chicken Hamper, with Homemade Chicken Mignons with Garlic Butter and Homemade Chicken Satay Skewers, Cesar Salad, Almond Dukka Potatoes, Ciabatta, Salad Dressing and Dijonaise, as well as a Dessert Cake of the day. There was something very special about cooking out on the terrace in the rainforest with the surrounding forest lit up. The lighting controls throughout the property cover everything for setting the perfect mood. The icing on the cake for us was the outdoor plunge pool set within the terrace. I can imagine it’s the perfect way to relax in the summer, however in the colder months it’s heated through solar panels. The retreat doesn’t have a gym, but it’s not missed. There are several mapped trails which are a must, we did all of the walks. They vary in lengths, with the longest being around 5k. It’s the perfect way to experience the rainforest with one of their picnics. We sampled their Deli Smoked Chicken picnic, which included Toasted Turkish Sandwiches with Layers of Smoked Chicken, Cranberry Sauce and Lettuce. Red Onion, Capsicum, Cue, Tomato Salad with Creamy Mustard Dressing. Local Organic Lemon and Ginger drinks, Chocolates and Organic Macadamia Nuts. Throughout the rainforest you will find rock pools, which are great for jumping in during the warmer months. We stuck with the hammocks which were roped across the water streams. Finally, seeing the glow worms are a must, but you will need to be brave enough to venture into the forest once it’s pitch black. Torches are available, and I can promise you it’s definitely worth it. 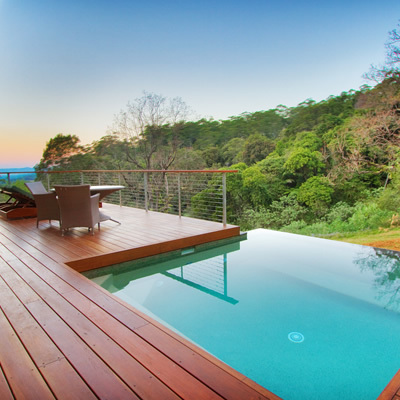 Crystal Creek Rainforest Retreat provided a memorable experience and one we would happily repeat, this is luxury self catering at its finest.